Why Vanessa Is Divorcing Donald Trump Jr.
"She’s seeking to more publicly, and less gently, disassociate." After 12 years of marriage, Donald Trump Jr. and his wife Vanessa have filed for divorce. Offering speculation that divorce was in the works, the New York Post reported that the couple has been living separate lives for some time. The paper credited much of the problem to the fact that Donald Jr. travels frequently. “He’s never there,” said an unnamed source. And when he’s not, it’s often because he’s traveling on behalf of his family’s company, working on behalf of his father, or otherwise saying or doing something in support of his dad. Which is a whole other way of making a spouse feel alone. Marriages in which one half of the couple is so engaged—emotionally, financially—in a parent’s life can leave the other partner feeling neglected. She might experience concerns about loyalty. Do I, or our family, ever come first? Or will his dad always win? Add to that a very public life—where you’re forced to look at your marriage, and your partner, through millions of eyes, rather than just your own—and the pressures can be too much for a couple to overcome. Although President Trump’s daughter Ivanka has assumed the most politically significant role among the president’s four children, Donald Jr. has been arguably the most high-profile. Along with his brother Eric he took over management of the Trump Organization after their father was elected. He regularly defends his father’s administration in interviews with the press and recently campaignedin Pennsylvania for the Republican candidate in a special election. Donald Jr. and Vanessa’s relationship was not necessarily built on privacy; the couple famously reenacted their engagement in a New Jersey mall in exchange for a free ring from Bailey Banks & Biddle. Later, Donald Jr. appeared as one of his father’s advisors on TV shows The Apprentice and Celebrity Apprentice. But politics offers a very different sort of spotlight, one that Vanessa might not have embraced, perhaps especially as her father in law’s administration became even more divisive and her husband’s defense of him became even more aggressive. At some point, it seems, Vanessa sought to gently disassociate. The New York Times reports that while Vanessa continued to retweet her husband’s Twitter posts about their family life, her tweets about him appeared to stop last summer. In early February, she skipped out on a family photo taken before President Trump’s first State of the Union address. But she couldn’t escape entirely: Last month, Vanessa and her mother were hospitalized after opening an envelope containing a white powdery substance that was later revealed to be cornstarch. Now, she’s seeking to more publicly, and less gently, disassociate. She and Donald Jr. have five children, so she’ll never be fully out of the Trump family spotlight. 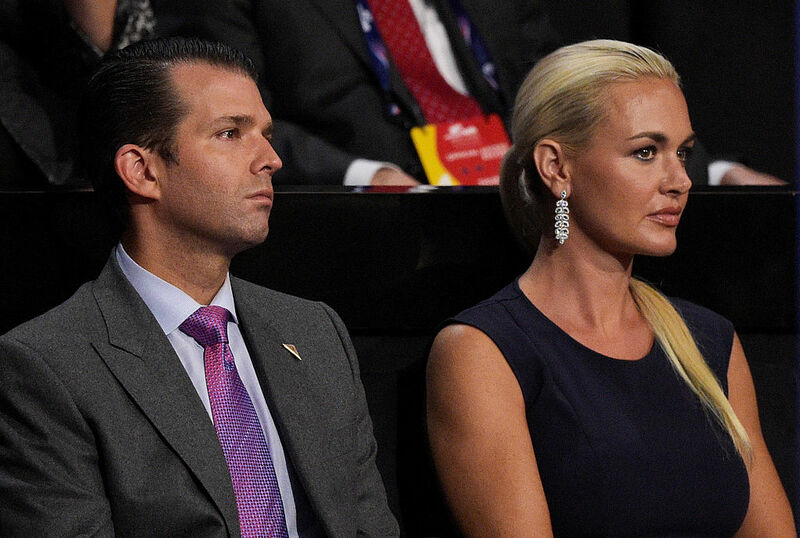 But nearly 15 years after being introduced to her future husband by her future father-in-law, she’s clearly stopped wondering if she’ll ever be first in the eyes of Donald Jr. As rumors circulate both that he has been unfaithful and that special counsel Robert Mueller will question Donald Jr. regarding his conversations with WikiLeaks and with Russians during the 2016 election, she may even be embracing the fact that she’s not. Can you blame her?